Barnes & Noble is kind of having a rough time of it these days. Oh, no, it’s not because nobody’s buying books anymore and they don’t know what to do with staff puttering around in the store with nothing to do; the problem is that Barnes & Noble is having the bookstore equivalent of a midlife crisis. They are a cliché middle-aged man who has died his hair blonde (the Nook), bought a sports car (the toys), and started having an affair with a woman half his age (um…coffee, I guess? This metaphor’s collapsed. Let’s not speak of it again.). The problem Barnes & Noble has had, and how to solve it, all seems pretty apparent to me, and so I’m going to apply my lack of business degree and also my terrible ability to handle money, and I’m going to suggest some solutions. First, I think the problem is largely one of a lack of confidence: Barnes & Noble saw their profits dip – much as everyone else’s dipped – and they saw the looming, gaping maw that is Amazon.com, and they panicked. Clearly the world didn’t want them to be a bookstore anymore, and so they began throwing ideas at the wall to see what would stick. First, it was coffee shops. Then it was the Nook e-ink reader and the Nook tablet. Pretty soon, it was aisles of toys occupying a huge section of the store, surrounded by a moat of calendars and stuffed animals. None of these are books, and none of them have seemed like a particularly good match for Barnes & Noble (there has even been talk, growing more persistent, that B&N is going to either eliminate their Nook hardware division, or spin it off into its own company, you know, like Joanie Loves Chachi. Yeah, I got yer business talk). Part of the problem is, you can feel the desperation. You can hear B&N going “is this what you want? This? What else? Please god don’t leave. Would you like a muffin? ?” Desperation puts people off. So Barnes & Noble needs to throw out the dead weight and get back to basics, and back to some sense. Away with the toys! Calendars, fine, but only one rack or so. We don’t need a wall of them. I approve of their rumors of abandoning the Nook hardware and focusing their ebookery (business term again, do try to keep up) on other people’s hardware. They can keep the coffee shops, the Starbucks. I have nothing against them, although you’d think I would, because frankly their tea tastes like motor oil drained out of a car which is also on fire at the time. I like the smell of coffee when I walk in. However, should they want to get rid of Starbucks, my suggestion would be to have a “coffee shop slot” in their big box store locations, which are then filled by a local coffee shop, who do their own thing. This serves two purposes. One, it gives each coffee shop a little bit of unique flavor, a different range of drinks and looks and baked goods, depending on what they like. This brings some life in, takes away the cookie-cutter feel. And two, the owners and workers of a local coffee shop are going to be a lot more invested in its success than the employees of Barnes & Noble Starbucks Outlet #45 are going to be, and that’s good for you. Enthusiasm and caring are always good. Next up, Barnes & Noble needs to understand that it doesn’t have to have gigantic box stores anymore. There was a period there when that was the thing to do, build a giant Wal-Mart-esque building, but I would argue that that age is past. Viewed objectively, a gigantic store like that for books is ridiculous. There is no giant Barnes & Noble-size store selling only video games, for example. There’s a reason for this. That doesn’t mean they have to go away altogether, of course…just that we don’t need so many of them, and what we do have need to change. Instead, they need to take advantage of the complete absence of Borders and fill their niche. 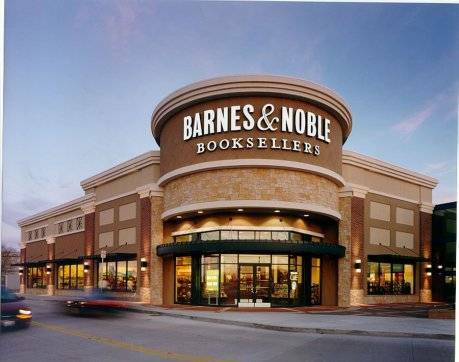 It wouldn’t hurt for a tiny Barnes & Noble store to open up in a local mall. Put one in every mall. Make them small and cool to be in. Best Buy does this to some success with their Best Buy Mobile outlets. Emulate Hot Topic here. Honest. I have never seen a free-standing Hot Topic store, but there’s one in every mall. Go and do thou likewise. Finally, as I said, this is all about confidence. Throw out the clutter, be willing to adapt and shift with the times (radically, if need be) but have the confidence to say “we sell books, dammit, if you want some Beanie Babies I suggest you go start your own business, good day to you!” and then afix your monocle proudly and go your own way to sell books. (Oh, I forgot, everyone who works there gets a monocle now. That’s important for business reasons.) Make it all about books, not just finding any crevice of any market to scrounge a few dollars and, honest, Barnes & Noble, I think you’ll do okay. You’ve got to change without losing your mind. Why do you have to change? Because I am so far beyond an avid reader, I am a hopeless book junkie. I am raising two small boys to also be book junkies. We have so many books…and, B&N? Almost none of them are from you anymore. Too many toys, producing too much noise. It’s like trying to get them to focus on reading inside a Toys R Us. We’ll happily come back. You just have to become sane again and make us want to. Otherwise, I’m afraid you aren’t long for this world, Barnes & Noble, and that would genuinely make me sad. I’ve bought so many wonderful books from you. Your staffs are frequently wonderful. They have the passion for books, even if you as a corporate-entity (ugh) seem to have lost it. I’d like to do more of that in the future. Good talk, business class dismissed. Oh, and I’d like a blueberry muffin. Thanks.